As a stylist working in the tech industry, I have a lot of women tell me that they feel uninspired when dressing for success in the workplace. I’ve noticed that a lot of women believe that they should be wearing masculine inspired pieces at work in order to be seen as an equal in their profession… Ladies, this is so far from the truth! As women, we have a lot of options and pieces that we can play with when dressing for success in the workplace. Displaying your personality through your outfit will spark that inspiration you’re lacking and will also leave a lasting impression on those around you in the workplace.Each piece that you wear should inspire something creative throughout your day and tell a story. As Coco Chanel once said, “dress shabbily and they remember the dress; dress impeccably and they remember the woman”. When I was living in Seattle, I was working at Microsoft within the Venture Integration IT team where my team and I handled multiple top-tier mergers and acquisitions for the company. I’ve been wanting to share with you what my day-to-day style looked like while I was working at Microsoft. Collaborating with Grayes has given me the perfect opportunity to share my typical work week with you. Monday’s are typically my busiest days at work, my day starts early and ends late. I would spend most of my day in meetings with some of the most authoritative people in the company, often incorporating a working lunch into my day. Knowing this, I would often wear a more formal outfit that made me look put-together, competent, and trustworthy amongst my colleagues. Here you can see me wearing a jacket dress from Grayes along with their pinstripe pants. Tuesday’s meant Tacos at Microsoft, which also meant messy. I was actually known for having the messiest forearms in the office thanks to our taco lunches, which is why I decided to wear a 3/4 length sleeve. Because Monday was often a hectic day at the office, I would sometimes restyle a piece that I wore the day before because I was so drained. An important thing to consider when deciding what you’re going to wear to work is practicality. Usually I would wear denim to work on Wednesdays, but last night I spent my time cuddled up at home watching The Matrix. Because there is a more relaxed dress-code at Microsoft, I’m able to pull some style inspiration from my favourite movie. Like I said before, it’s important to have a little fun with your outfits at work (of course, when appropriate) and show off your personality and what inspires you! Today, I’m channeling my inner Trinity working alongside my engineer colleagues wearing the jacket dress from Grayes. Last night I got a Facebook memory notification from when I sold my motorcycle gear 3 years ago so I decided to further embrace my feminine side through my Thursday outfit. It also happened to be really hot outside so the flowy-ness of this top was very fitting. Today I’m wearing the pinstripe pants from Grayes. Fridays tend to be very casual in the office. My colleagues and I would often leave work a little earlier on Fridays to jump start our weekend and spend some time with our friends and family. My friends and I would often take a road trip to Whistler and enjoy the weekend there together! This Friday, I got word that I was accepted to a project that I really wanted, I knew that I would want to celebrate during the evening. So I decided to wear an outfit that could easily transition from day to night. To achieve this versatility, I wore a sheer back top under my jacket dress from Grayes. A want to say a huge thank you to Grayes for collaborating with me and allowing me to give you an inside look at how I dress for success in the workplace. I love the fit of the jacket dress and found that it hugged me in all the right places. It’s also a very versatile piece that can be tailored to fit any outfit. Another item that kept me really cool during my work week are the pinstripe trousers. As someone who is going through a post-pregnancy weight loss journey, I love how flattering these pants were on me. 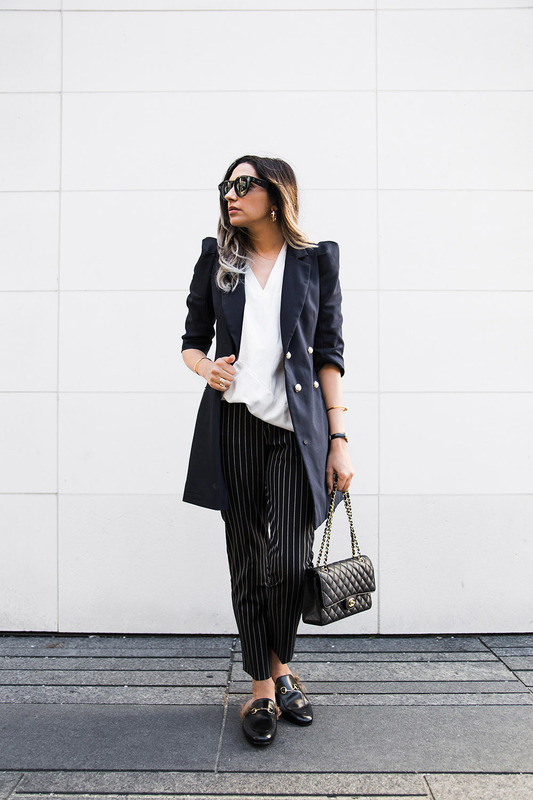 I actually never owned a pair of pinstripe trousers before and now I’m looking to get the matching top as well. Disclaimer: This post was sponsored by Grayes. All opinions expressed in this post are my own. Photography done by Raad Rahman and Chris Smart. I am loving this look. Infact was thinking to post something similar. You look effortlessly Fabulous!! I love this post and the outfit photos! I love the classic elements working on all of these outfits. The pinstriped pants is my favorite piece!